Venezuela has, if the people give a YES vote to this Constitutional change and a new name: República Bolivariana de Venezuela. However, the Flag will remain the same. No official shades have been issued with regard to either the stripes or the arms, and no recommendations for the arms are given in any official source. However, the UK Flag Institute give yellow PMS 109C, blue PMS 280C and red 032C, BR20: Yellow, red PMS 186C and blue PMS 280C, and the Album des Pavillons yellow 116C, blue 286C and red 186C. "Article 3. The National Flag is inspired by the flag adopted by the Congress of the Republic in 1811. It consists of the colors yellow, blue and red, in united, equal and horizontal stripes, in the preceding order from top to bottom, and, in the midst of the blue stripe, eight five-pointed white stars placed in an upwardly convex arc of a circle. The National Flag used by the Presidency of the Republic and by the National Armed Forces, as well as those hoisted upon national, state, and municipal public buildings, shall include the Coat of Arms of the Bolivarian Republic of Venezuela at the edge of the yellow stripe near the hoist. The National Flag used by the Merchant marine shall bear only the eight stars. 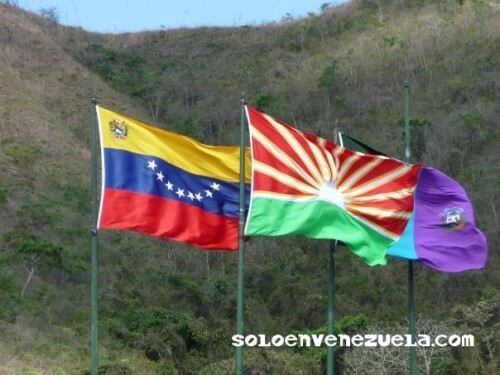 The 2006 Flags are based on drawings available at <www.asambleanacional.gov.ve>. For Venezuela: PMS 102 yellow, 293 blue, 032 red, 355 green and black. The vertical flag is simply the horizontal version turned 90 degrees clockwise. By decree signed on 3 July 1963, President of the Republic of Venezuela Rómulo Betancourt prescribed the 12th March as the Flag Day (Día de la Bandera). This Day commemorates 12 March 1806, when Miranda hoisted for the first time the flag of freedom on the vessel "Leandro", in the bay of Jacmel in Haiti, and Miranda's first revolutionary expedition. This Day has to be historically considered with 3 August 1806, the day Miranda hoisted the flag for the first time on the territory of Venezuela, and on Sunday 14 July 1811, the day when Prudencio and José María, the sons José María España, hoisted for the first time on the great square of Caracas the Tricolor flag selected by the Constituent Assembly (Congreso Constituyente). Source: Rafael Marrón González, Venezolanidad - Venezuela en mil preguntas (LXXXVIII) "Correo del Caroní", 12 November 2005. On 21 August 2006, the Council of the Ministers of Venezuela approved the Decree prescribing the change of the National Flag Day from the 12 March for the 3 August. The change was required by President of the Republic Hugo Chávez, in order to celebrate the national flag on the day when Francisco de Miranda hoisted the national tricolor flag on the Venezuelan land for the first time, on 3 August 1806. Source: El Universal, 22 August 2006. See here photo of erroneous Venezuelan flag, with stars upside down. Other flag visible on photo are flag of Lara state and Palavecino municipality. The 2010 Miss Universe contest, held on 23 August in Las Vegas (USA), caused a big fuss in Venezuela. During the ceremony, Stefania Fernández, Miss Universe 2009, "abandoned" her crown and waved her national flag. Everyone in Venezuela immediately noticed that the flag had seven stars, that is, matched the flag used until 2006 and changed for the flag with eight star upon request by President Chávez. The "blunder" was perceived as a political message and a support to the opposition, since general elections were scheduled one month later. Ironically enough, Stefania Fernández appeared one year before in the 2009 Miss Universe gala wearing a red dress, which was perceived by some as a support to Chávez. On 13 May 2012, fans of car races watched on TV Pastor Maldonado winning the F1 Spanish Grand Prix, ran on the Circuit of Catalunya, Barcelona. The first win ever in F1 by a pilot from Venezuela was celebrated with a flag blunder; during the medal ceremony, the flag of Venezuela raised over the stand had seven instead of eight stars. The blunder caused a great stir, especially in Venezuela, so that the FIA issued a press release acknowledging the blunder and promising it won't happen again.